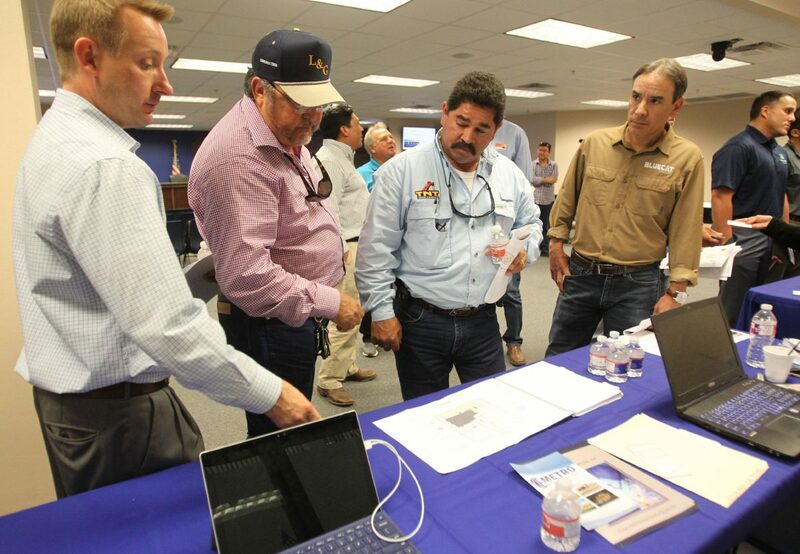 Hidalgo County hosted laborers and contractors for a meet and greet with the construction team tasked with building the new courthouse on Wednesday in Edinburg. EDINBURG — Dozens of hopeful vendors and laborers met Wednesday with the prime contractor for the new county courthouse in hopes of landing a piece of the pie. 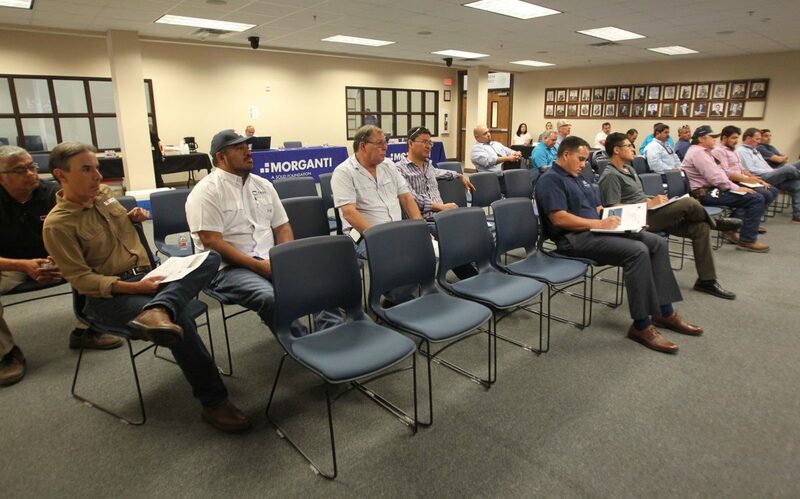 Morganti Texas, the construction manager-at-risk for the $150 million project, set up shop inside the Hidalgo County Commissioners’ courtroom Wednesday to offer two informational sessions to local businesses interested in subcontracting. The event, dubbed Meet the Prime, drew between 50 to 60 local vendors specializing in a variety of construction aspects, from door hardware, to concrete, to security systems. “The turnout was probably better than we expected,” said Brian McIntyre, a Jacobs senior project manager. Paul Kummer, project executive with Morganti Texas, talks with prospective clients during the Hidalgo County meet and greet for laborers and contractors with the construction team tasked with building the new courthouse on Wednesday in Edinburg. The morning and afternoon sessions were designed to begin a discussion with the local contracting community, offering information about the proposed timeline and the requirements that must be met. Last week HDR, the architectural firm selected for the project, submitted what officials are calling “an early package” that addresses the work that will happen below the surface, such as utilities, demolition and fencing. “That’s the first package that bids,” McIntyre said, adding the bid will likely be opened in mid-August. The project is nearing the completion of the design development phase. Judges who previously toured a courtroom mockup recently approved what is believed to be the final design for their new chambers during a board of judges meeting. The final courtroom design includes a few changes the judges suggested after their tour, so the mockup is being altered to reflect those changes with judges expected to conduct one more tour before the end of the month. The team discussed several points of interest with Edinburg officials, including the eventual closing of Closner Boulevard and getting the word out to the community about it, as well as traffic signals, onsite utilities, and parking, McIntyre said. Parking is perhaps the biggest concern for the public, Hidalgo County Commissioner Eddie Cantu said. “That’s a question that comes up every day,” he told McIntyre, urging his team to finalize a parking study. McIntyre said the study was in the final stages and would likely be presented to the public at the end of the July. “There’s a good month of time for that message to get out to people about where they’re supposed to go when they have court business to take care of,” he told Cantu.